Two supreme court justices, Justices Sylvester Ngwuta and John Okoro were arrested at the residence in the early hours of Saturday by operatives of the Directorate of State services, DSS. The arrest which has been confirmed by the Media aide to the Chief Justice of Nigeria, Mr. Ahuraka Isah. Though Mr Isah said he is yet to know the reason for the arrest, he clarified that Justice Walter Onnoghen, the next in rank to the incumbent CJN, Justice Mahmud Mohammed, was not among the Justices of the apex court arrested as earlier reported. He said, “What I can tell you for now is that Justices Ngwuta and Okoro were arrested early hours of today. But DSS in a statement released to the media said that the search and arrest of the justices were in connection with alleged corrupt practices involving them which the DSS said they have been investigating for sometime now. Multiple sources said the clampdown on justices of supreme court and the high court began in Gombe State where the SSS arrested Muazu Pindiga who served on the elections tribunal in Rivers State. Sources also confirmed that Justice Adeniyi Ademola of the Federal High Court in Abuja was also arrested by the operatives of the DSS after invading his official residence at about 1am on Saturday. 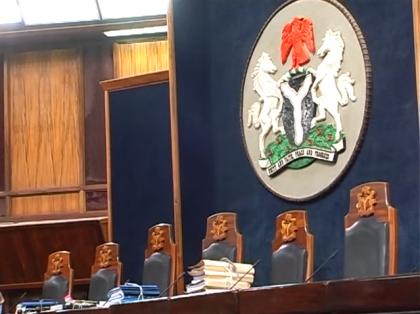 The official residence of another judge of the Federal High Court in Abuja, Justice Nnamdi Dimgba, who is a neighbour to Justice Ademola on S. O Ogbemudia Crescent, Zone E of Apo Legislative Quarters, Abuja, was also searched, though Justice Dimgba was not arrested. The SSS also raided the home of a high court judge in Kano, Kabiru Auta, along with another residence in Enugu belonging to the Chief Judge of the state, A. I. Umezulike. An attempt by DSS operatives to search the residence of Justice Mohammed Liman, residing at Number 35 Forces Avenue in Port Harcourt,was resisted by Gov Nyesom Wike of Rivers state. Gov. Wike told journalists who besieged the scene that he would not allow the SSS and other security agencies perpetrate “needless impunity” in the state.